There are a lot of buggy and error prone programs and applications for Windows operating system that may cause your system, desktop or application itself to behave strangely. Beside, the program may be not responding too. Sometimes in worse case, an application may have memory leak where used memory are not released to other purpose, and uses up all available CPU or system resource, causing system to unresponsive or freeze, and simply hang up on you. 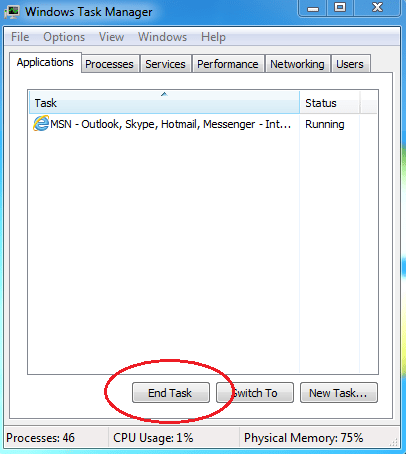 In this situation, it’s possible to stop or end the not responding application or process by using Windows Task Manager. Press Ctrl+Alt+Del keys simultaneously, and then click on Task Manager. Alternatively, right click on Taskbar and select Task Manager. You can also start Task Manager by manually starting taskmgr from Run command in Start Menu. In the Windows Task Manager window, locate and select (highlight) the application or program that’s not responding. In your system is crawling and extremely slow in responding, you may also check out for services or processes that using too much CPU resources or memory resources. A Task Manager Warning dialog saying “Terminating a process can cause undesired results including loss of data and system instability. The process will not be given the chance to save its state or data before it is terminated. Are you sure you want to terminate the process?” will appear. Confirm the process by clicking on OK or End Now.